President Maithripala Sirisena ceremonially unveiled the new bronze colour statue of late Prime Minister Dudley Senanayake in Colombo adjacent to the Borella Kanatte roundabout that was also officially renamed ‘Dudley ‘Senanayake Roundabout’ in honour of the late leader on 11 December amidst a large gathering. Speaking at the ceremony President Sirisena said that statues of leaders were erected in order to appreciate their exemplary personal qualities and leadership and many leaders of that era possessed such qualities and were great leaders. “Dudley Senanayake was a leader whom the youth can emulate,” he said and reminisced about the time he met Senanayake when he [the President] was just 14 years old and how meeting him had left a lasting impression. Born on 19 June 1911, Dudley Shelton Senanayake became the second Prime Minister of Sri Lanka after the tragic death of his father (first Prime Minister, D.S. Senanayake). Dudley was Prime Minister on two more occasions serving the longest from 1965 to ’70. His exemplary qualities of impeccable integrity, honesty and simplicity earned him a special place in the hearts of the people and among friends and political foes alike. He passed away on 13 April 1973. Prime Minister Ranil Wickremesinghe, Speaker Karu Jayasuriya, Joint Opposition Co-Leader Dinesh Gunewardena and Tamil United Liberation Front Leader V. Anandasangaree were the Guests of Honour and the key speakers. Dinesh Gunewardena traced history and spoke of how his father Philip Gunewardena joined ranks with Dudley Senanayake and how it led to a strong lifetime friendship between them. Philip Gunewardena, who was known as the ‘Father of Marxism’ in Sri Lanka, was a powerful opponent of the United National Party. Following the support he gave Dudley Senanayake by joining him and opposing the coalition led by Sirimavo Bandaranaike, he was invited to join the Government Dudley Senanayake formed soon after winning the 1965 election. The bond between them lasted their lifetime. Former UNP Minister Jinedasa Nihethepala, wife of Bharatha Lakshman Premachandra, Sumana Premachandra, Trustee of the Kalutara Bodiya Ajitha De Zoyza, former Foreign Minister G.L. Peiris, former Defence Secretary Gotabaya Rajapaksa and former YMBA President Suren Abeygoonasekera were the notable special invitees who were present at the occasion. The imposing new bronze colour statue that was unveiled is the work of renowned sculptor Gunasena Kurulugama, whose other outstanding creative work of leading political personalities dot the city. The gigantic operation of the removal of the old statue and installation of the new was headed by Chandima De Silva, Secretary of the Dudley Senanayake Memorial Society (DSMS), ably assisted by his team. He successfully saw to the tedious paper work that was required for the renaming of the roundabout and also spearheaded the DSMS Organising Committee of the Sunday function on the direction of DSMS Patron Rukman Senanayake and DMSM President Dr. Karunasena Kodithuwakku. Although Dr. Karunasena Kodithuwakku is in China serving currently as Sri Lanka’s Ambassador there, he presided at the inaugural meeting and laid the required groundwork as DSMS President and followed up thereafter on each of his short visits to the country. Sunday’s function was followed by tea for the special invitees arranged by the DSMS at the office of late Bharatha Lakshman Premachandra at 171 Kynsey Road, facilitated by his wife. The office is situated adjacent to the statue. Fitting to the occasion, a 100-year-old couch on which Dudley Senanayake had sat on his last visit to late Minister P.C. Imbulana’s ancestral house in Ruwanwella during the intense election campaign in 1970 was among the heirlooms provided by DSMS Committee member Charnika Imbulana Munasinghe, as part of the furniture that was required for the function. With a design of the British Coat of Arms at the centre, the ivory-embedded exquisite kaluwara antique being one of its kind in Sri Lanka caught the attention of President Sirisena and Prime Minister Wickremesinghe. They were seen seated together on the same couch having tea and recalling the election held 46 years ago with Devinda Senanayake, late Dudley Senanayake’s nephew, Charnika Imbulana, niece of late P.C. Imbulana, and Vasantha Senanayaka, grandnephew of Dudley Senanayake. The successfully-concluded function of the unveiling of the new statue of Dudley Senanayake was attended by a large number of people that also included members of the Maha Sangha, dignitaries of all other religions, family members headed by Deputy Ministers of the current Government, Ruwan Wijewardena and Vasantha Senanayaka, friends of the family, all other members of the Dudley Senanayake Memorial Society and admirers of the former Prime Minister. 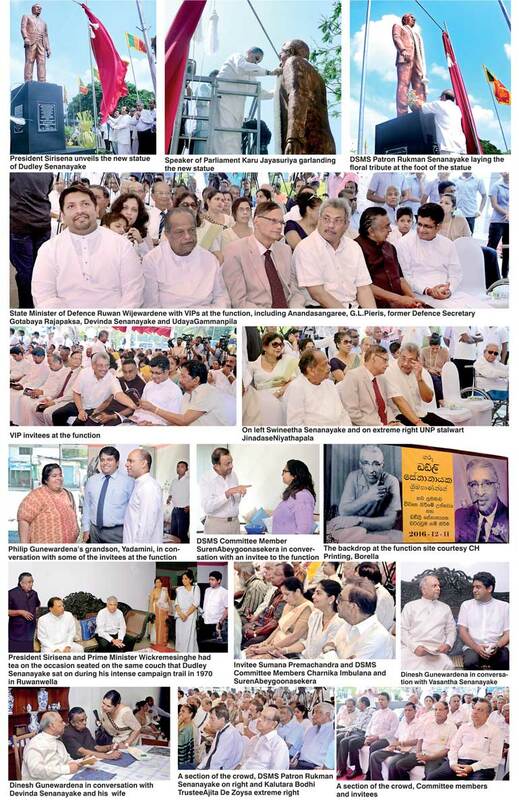 The function was open to the general public.